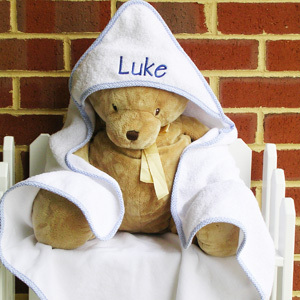 Our hooded towel sets will help a baby look and feel warm and cozy. Wrap them in our absorbent, 100% white cotton, full terry towels bound in pink.or blue trim. Towel measures 38" x 38" and the matching terry glove is 6" x 9" Don’t leave the bath without it! Shown: White/Blue w/ Style 10.